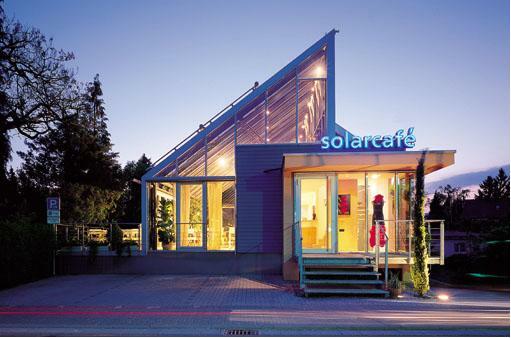 Summary The “Solar Café” in Kirchzarten near Freiburg is an demonstration object for the POWER-Cell of the German Sunways Inc. in Constance. The translucent POWER-Cell offers architects and planners new possibilities of the design of aesthetic, high quality facades, witch produce energy from sunlight. The transparent modules replace the traditional shadow-creating elements and reduce energy expenditure for cooling rooms. The special surface structure of the POWER-cell should, if vertically mounted, increase the energy yield of PV systems even more. The guests of the "Solar Café" can enjoy their cappuccino on the shady terrace in summer, while the PV system located above their heads delivers a peak output of 1 kilowatt. Four vacuum pipe collectors supply hot water and also support the heating system. A wood pellet boiler is used for back up heating.